How these variations are modeled in real? How foundry provide the corresponding data? How to read that one and provide the info to different tools? Let’s start with the Summary figures of last post. Note: Blue is what we need ideally and brown is what we will get actually/practically. As we have discussed in last few post that there are basically 3 parameters which are affected a lot. From the above figure and also from statement, you can easily conclude that there are 2 mainly type of variation – In width and In height. Let’s start one by one. There are different ways to model variation information of this parameter. Different EDA vendors code this info in different way (I will summarize this in the last of this Article series). Similarly, Foundries also provide this info in different way. Most common and simpler form of variation is “variation in percentage” or “absolute numbers” in the form of table. 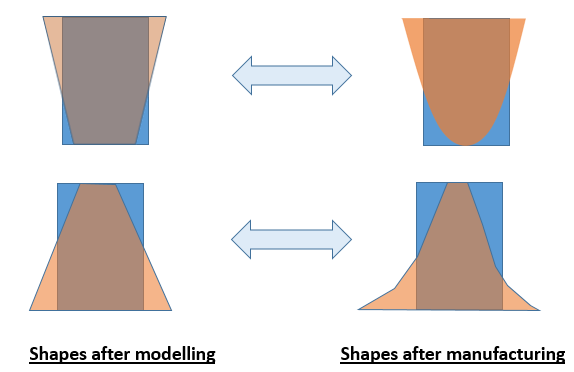 Structure wise after applying the variation type 1, we may get below patterns or we can say that we are modeling only below type of variation in the shapes. I would say – think and if you forget then please refer Parasitic Interconnect Corner article. It will help you to refresh your concept And don’t worry I will also summarize this later on. 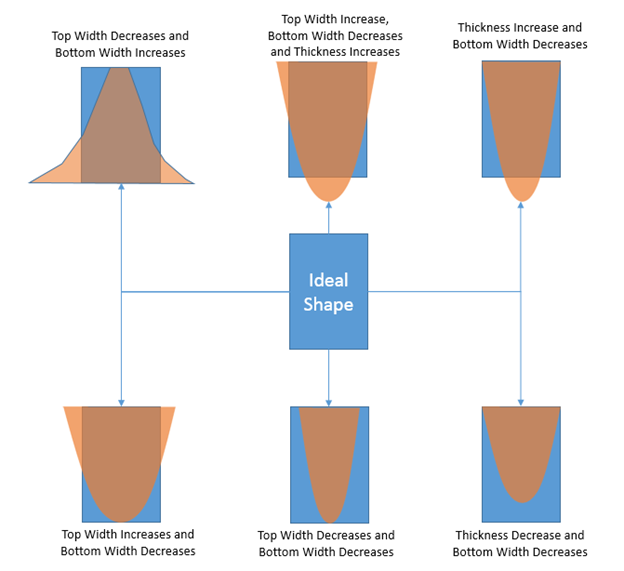 In this we will remove the restriction of Type 1 (same bottom and top width variation). It’s now more closure toward the practical shape. And foundry consider this for 180nm and below nodes. Because of several fabrication steps (already discussed in last few Articles of this series), final shape of the Metal is not rectangular. It’s trapezoidal, so we have to define 2 widths. Here we are considering that “bottom delta” = “top delta”. In case, top_width_delta=bottom_width_delta, we can model this by using the angle Ɵ also. Where tan Ɵ = 2B/2A and known as Tangent. So, in all the above case the table (or say info provided by Foundry) can be any of the following. 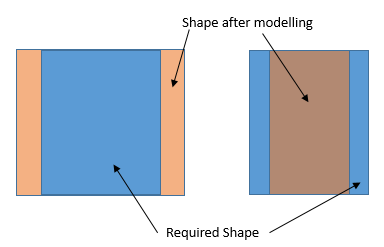 Structure wise after applying the variation type 2, we may get below patterns or we can say that we are modeling only below type of variation in the shapes. I am sure you are able to co-relate these with the real structure or shapes (Snapshot of last few article summary). But if you are still confused, please refer below figure. After seeing above figure, you may be thinking that it’s not 100% matching. For that variation Type 3 can help you.